The Republican Presidential candidates have proposed radical changes to the US income tax system. The changes they propose would lead to truly gigantic tax cuts for the rich, historically unprecedented even under Bush or Reagan, and would create a radically more regressive tax structure compared to what we have now. And with the notable exception of 9-9-9 Plan proposed by Herman Cain, the tax plans would also collect far less revenue than the current system, at a time when the same Republican candidates complain loudly that government deficits will lead the country to ruin. A reform of the US tax system is clearly important. The current system is far too complex, with numerous loopholes and special interest provisions, that make it possible for many of the truly super-rich to pay taxes at rates below that of their secretaries, as Warren Buffett has noted. But instead of tackling this, the Republican proposals would make the problem even worse. The Tax Policy Center (TPC), a joint program of the Urban Institute and Brookings, has undertaken a careful and consistent analysis of the Republican candidate proposals. A summary by TPC of each of the Republican plans is available here. The Tax Policy Center has also prepared detailed simulations of the implications of three of the Republican proposals: those by Cain, Perry, and Gingrich. The graph above was drawn from these results, which are available at the TPC web site here. The numbers are worked out from a Microsimulation model developed by TPC, which is similar in nature to tax models used by the Congressional Budget Office, the US Treasury, and others. The TPC model is based on actual 2004 individual tax return data, with the figures then projected forward (or “aged”) based on actual and projected economic growth and structural changes. With this model, TPC can work out the tax implications for individual groups of proposed new tax rates and rules. TPC has not undertaken such a simulation analysis of the Mitt Romney proposals. To be fair, the Romney tax proposals are more limited than the radical changes proposed by all of the other candidates. Romney would extend the Bush tax cuts, would cut the tax rate on corporate profits to 25% from the current 35%, would cut capital gains taxes to zero for all households below $200,000 in annual income, and would eliminate the estate tax (which only impacts the rich). All the other Republican candidates have proposed far more radical changes. The Cain proposals are the most radical. While Cain himself has “suspended” his campaign, his withdrawal from the race was due to multiple and separate charges of sexual harassment by several women coming forward, plus the revelation by another woman of a 13 year long affair with Cain while he was married. The campaign suspension was not due to his tax proposals, and indeed, all indications are that Cain’s 9-9-9 plan was and remains extremely popular among the Republican faithful. Cain would replace the entire income tax system (including Social Security and Medicare taxes) with a flat 9% tax on personal incomes, a 9% tax on corporate incomes, and a 9% retail sales tax. The graph above shows what the resulting average tax rates would be on households, by income category. Taxes paid as a share of income would go under Cain from the relatively progressive rates shown (in black for what current law would be after 2012, or in blue for what they would be if the Bush tax cuts are renewed rather than allowed to expire in 2012 as per current law), to a fairly flat rate of normally 22 to 24% for those making up to $200,000. They would then drop to 18% for those making over $500,000. That is, under Cain’s plan, taxes would go up for the poor and middle class (all those making less than $100,000), and then drop sharply for the very rich. 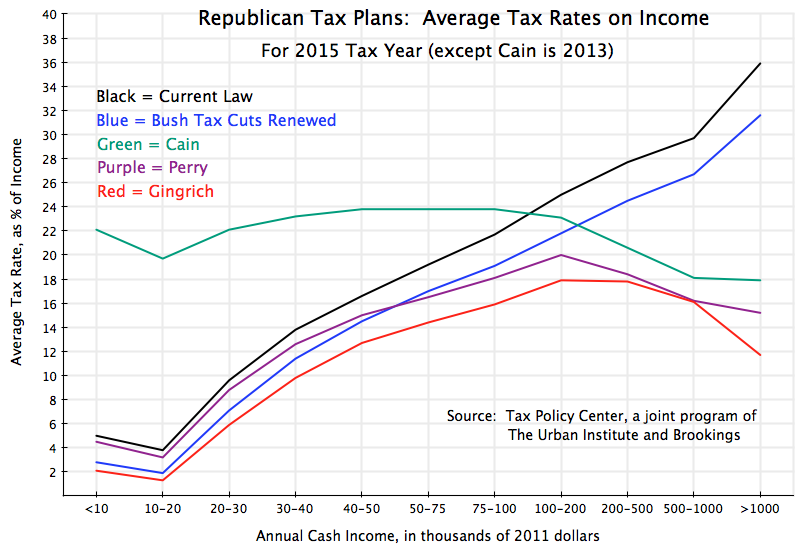 Close to 90% of the population (the poorest 90%) would end up paying more taxes under Cain’s proposal. The richest 10% would pay less. Households at poverty line income (the group earning between $20 and $30,000) pay less than 10% of their income in taxes under current law, but under Cain their taxes would more than double, to 22% of income. And the rich and super-rich (all those making over $500,000), would see not only a sharp cut in their taxes due, but such a sharp drop that they would end up paying a lower share of their income in taxes than the poor would. It should be noted that the Tax Policy Center did ask Cain representatives about this, and the representatives indicated there would be some transfers made to fix this glaring issue. But they could not provide any specifics on what would be done, and hence the calculations here could not factor in what they would be. But while Cain would move the tax system to a sharply regressive one, even more regressive than Perry and Gingrich propose, at least his system would raise almost as much in taxes as the current system. That is, Cain is simply and directly proposing a redistribution of the tax burden, with the poor and middle class paying far more so that the rich can pay less. Total tax revenues would fall by about $200 billion a year in the Cain system, which while not small, is still far less than the $1.28 trillion reduction that would follow under the Gingrich plan, and $1.0 trillion reduction under Perry (see below). And indeed under Cain, total tax revenues would go up by about $100 billion for all those making less than $1 million dollars a year. But Cain would then cut taxes by a total of $300 billion on all those making more than $1 million (with an average annual income of about $3 million each among them), leading to the net loss of $200 billion. The Gingrich and Perry plans are broadly similar in nature to each other, but the Perry plan less extreme. Both Gingrich and Perry would give taxpayers the option of paying taxes due under the “present” system (defined as the current law by Perry, but defined by Gingrich as the rates that would apply with the Bush tax cuts extended), or paying a flat rate of 20% (Perry) or 15% (Gingrich). Both would cut taxes on capital gains to zero and repeal the AMT for those choosing the flat taxes, would cut taxes on corporate profits (to 12.5% for Gingrich and 20% for Perry, from the current 35%), and would end the estate tax. It is interesting that under Perry, taxes would actually be higher for the poor and lower middle class (all those households making up to $50,000) than they would be if the Bush tax cuts are extended. But taxes under Perry would be cut drastically for the rich. The result would be a radical reduction in tax rates, for all under Gingrich, and for especially the very rich under both Perry and Gingrich. They would fall so far under Gingrich that millionaires as a group (and not simply some individual millionaires who can take advantage of special loopholes) would pay a lower average tax rate than those earning $40,000 a year. For Perry, millionaires would on average pay the same rate as those earning $40 to 50,000. That is, middle income households earning between $50,000 and $500,000 a year would pay a higher rate of taxes than millionaires. The US tax system has never been regressive in this way. Furthermore, the Gingrich and Perry tax plans would collect far less in revenue than the current system: $1.28 trillion less in 2015 under Gingrich, and $1.0 trillion less under Perry, as noted above. Republicans might argue that these reduced revenues should simply be matched by cuts in government spending, so that the deficit does not rise as a result. But the most recent projection by the Congressional Budget Office indicates that total federal government discretionary spending in 2015 (including all military spending) would only be $1.26 billion. Even Republicans would agree that one cannot eliminate the entire military budget. This is simply not serious. Yet these are the presidential contenders of the principal opposition party in the US. This entry was posted in Fiscal Issues, More Political than Economic and tagged policy, tax system, taxes, US politics by aneconomicsense. Bookmark the permalink.